I predicted robot taxis and trucks by 2020. Most doubted it, but I maintained I was as likely to be too late as opposed to too early. The future has arrived, at least in Japan. 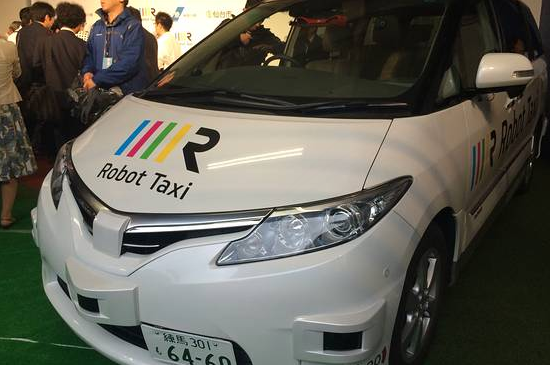 Autonomous taxis will operate in test mode next year with a goal of full production by 2020. "Hey Mish, I saw this article and it reminded me of your self-driving cars posts some time ago. When I read your posts I thought your time frame on their arrival seemed a bit optimistic. But here we are." Note the car still has a steering wheel. That steering wheel will be gone by 2020. Self-driving trucks in real conditions are on highways in Germany. It's just a test, but it won't take five years for live operation. Truck Yeah! reports Daimler's Autonomous Truck Successfully Completed Its Maiden Voyage On A Public Highway. Following up on their American Adventures, Mercedes successfully tested its semi-autonomous Highway Pilot system on the German Autobahn. This technology can be fitted into regular production trucks and is a huge step towards fully autonomous transportation. The Federal State of Baden-Württemberg set Daimler Trucks loose on its highways, showing the world that the technology is pretty much production ready despite the missing legal context surrounding autonomous vehicles. At this stage, the driver remains in control despite the truck accelerating, braking and steering on its own, but Daimler says humans can never drive as efficiently as the robot does, and since the aim is to minimize fuel consumption while improving traffic flow, driverless transportation is what we’re looking at in the long run. German automaker Daimler said it trialled a self-driving truck under real traffic conditions for the first time Friday, on a motorway in southern Germany. This is likely to snowball much faster than I expected two years ago. And as I have stated numerous times, millions of truck driving and taxi driving jobs will vanish by 2025 at the latest.